The Eco Waste Solutions (EWS) ECO-Mobile is a containerized portable waste disposal unit designed for deployment anywhere in the world allowing users to eliminate waste on-site and reduce the risk of environmental impacts. 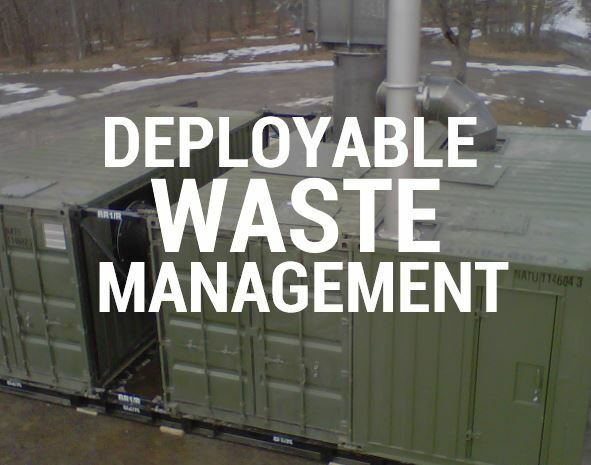 The EWS Mobile Waste Oxidizer can process a range of waste materials including domestic waste, tires, medical waste and waste oil. Waste is gasified and reduced by over 90% of its original volume to a sterile, inert residual material suitable for recycling into useful by-products. Unlike other mobile incinerators, the air emissions of the ECO Mobile are extremely clean and the package can included the exclusive EWS containerized Air Pollution Control (scrubber) package to meet any environmental standard in place today. Additional modules for heat recovery are also available. The unique plug and play design (patent pending) is operational within hours of arrival at the point-of-need. Want more information? Get in touch – we’d love to hear from you.